سواءً كنت مسافراً بغرض السياحة أو العمل, إيبيس بدجيت سيدني أوليمبيك بارك هو خيار عظيم للإقامة خلال زيارتك سيدني. يمكن من هنا للضيوف الاستمتاع بسهولة الوصول إلى كل ما تقدمه هذه المدينة النابضة بالحياة. يضفي محيط الفندق اللطيف وقربه من ‪State of Origin‬, ANZ Stadium, ‪Olympic Stadium‬ سحراً خاصاً على هذا الفندق. كما يقدم إيبيس بدجيت سيدني أوليمبيك بارك الكثير من الخدمات لإغناء رحلتك في سيدني. يقدم هذا الفندق العديد من الخدمات الكفيلة بإرضاء أكثر الضيوف تطلباً. ادخل إلى واحدة من الغرف 156 وتخلص من عناء نهار طويل بمساعدة مجموعة كبيرة من الخدمات كمثل تلفزيون بشاشة مسطحة, غرف لغير المدخنين, مكيف هواء, تدفئة, مكتب الموجودة في بعض الغرف. كما أن مجموعة الخدمات الواسعة الموجودة في الفندق لضمان راحتك تترك لك الكثير من الخيارات لقضاء وقتك أثناء فترة إقامتك. مهما كانت أسبابك لزيارة سيدني، فإن إيبيس بدجيت سيدني أوليمبيك بارك هو الخيار الأفضل لإقامة مثيرة وممتعة. a bit expensive for a little shoebox! extra small bathroom- bathroom wasn't even private. no good for any privacy. very very small. good location, nice staff. but room was cramped and no room in so called bathroom. The price was outstanding, we stayed for the tennis & walked to the venue. All we needed was a bed, shower & somewhere for our stuff. It was a convenient stay & we enjoyed it too. Aircon, bed & TV were all good. Didn't stay for breakfast but it looked alright. Would stay there again if going up for an event at the Olympic Park. It was a small little hotel, but it was small enough to call it cosy! Beds were comfortable, view from room was lovely, staff were understanding and helpful! Only thing I an fault was their bathroom, it was quite small and awkward, but none the less I was very happy with my stay! We booked this hotel as it was close to Qudos Arena. It was a bit more expensive to stay as an event was on. But it was convenient as it was only a short walk to Qudos. Room had everything we needed for an overnight stay, tea & coffee, tv, shower, air conditioning - was perfect. i ask to staff to keep some money when i left the hotel and made sure the staff would give that money to my friend, but when my friend was at the lobby he kept saying there was no one keeping money and doesn't know about it at all. finally we got in his pocket and we found the money. too bad. friendly staff ,cheap breaky convienient for me for work. Excellent comfortable queen beds. Mattress on bunks is too thin and uncomfortable. Fridge in room convenient although not working well in room 430. I stay at this hotel at least four times a year and will continue to. It is not bad as you think up to price. There are many rooms available and staff is pretty kind. but there are some problem tht there's not many train go to city but the price is the always best offer in Sydney. You won't find any hotel under 100.remember there're many people only when there's big event so you need to be be careful when you boot the hote. Take your own shampoo and conditioner as these were not supplied. staff were great and the room was very clean. Rail station within walking distance of Ibis budget and goes to the Circular Quay where you can walk over to the Sydney Opera House.From Circular Quay you can catch a ferry to many destinations and get on and off. There is a Casino at which there is a ferry stop.You can also choose to climb the Sydney Harbour Bridge or climb up to the top of the Parapets. Many many eating places everywhere you go. The National Museum is very very good. Have stayed here before and cleanliness has definitely gone down hill. Rooms are small and it did not help that we had a three bed room with the third bed on top of the queen which was a little restricting. Its convenient for where we were going but next time will stay else where. 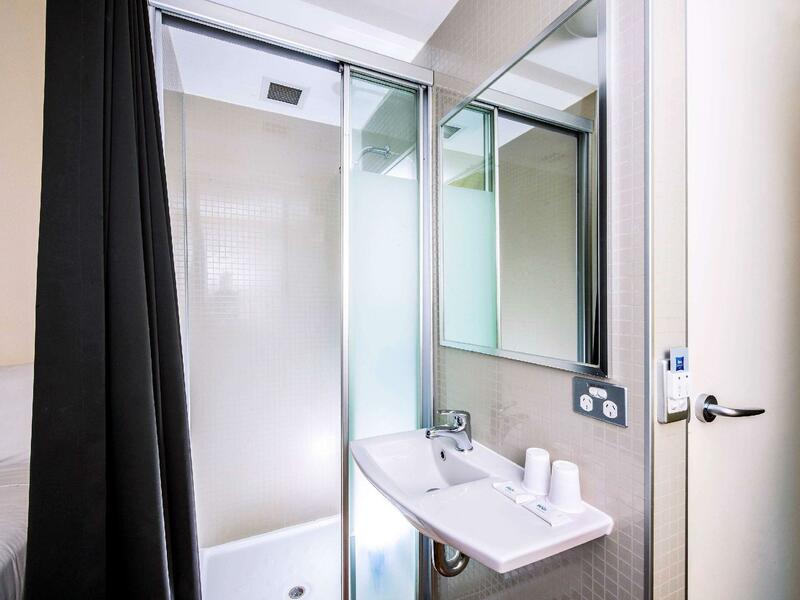 Easy to book, great location right near the ANZ and Allphones arena, clean room, nice staff. Cheapest hotel in the area. Perfect if you don't need anything fancy, just a suitable place to sleep at night. Budget hotel: you get what you pay for. But what you do get is excellent. Comfy beds, friendly staff, available parking, and a kitchen in the lobby. 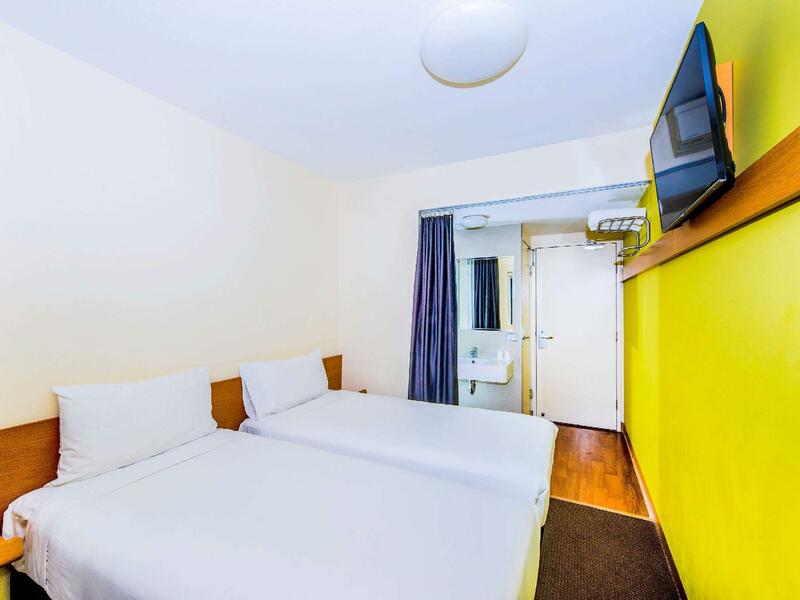 It's a place to park, sleep and shower for any events you're attending around Olympic park. 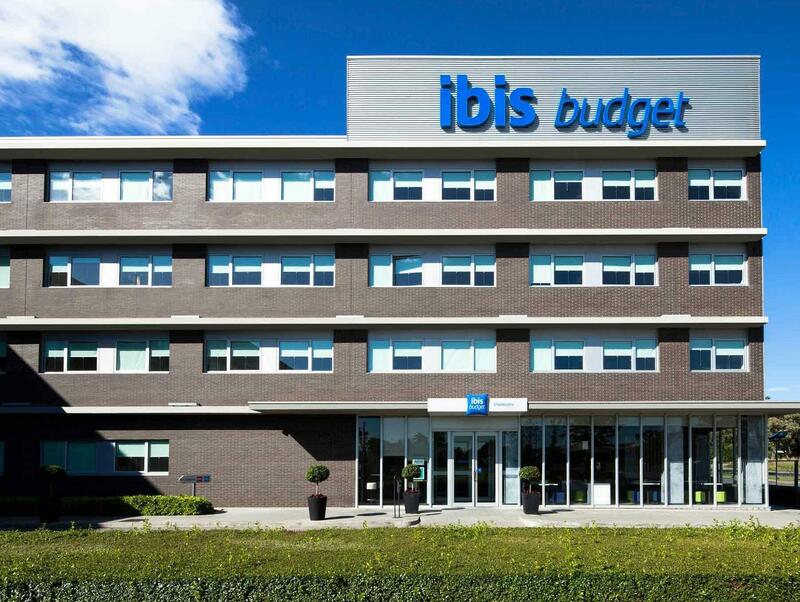 Extremely happy with ibis budget, I will be staying there for next year's event. We enjoyed our stay while at the final weekend of the Netball World Cup. It was cheap and close to the venue. It fulfilled its purpose of somewhere to shower and sleep. Our room was clean, but if I sat up in bed too quickly I risked hitting my head on the single bunk bed over the top of the queen. We took our own kettle and toaster so we didn't have to go downstairs to get a hot drink or breakfast. Apparently some upgrades are being done to put fridges and kettles in more rooms. Can highly recommend the Rumps and Ribs restaurant 5 minutes walk away. Was a good place overall, 5 mins walk to fastfood chanins like macs & subway. If you're driving, lane behind hotel has free night parking. Can choose to park at hotel @$15/day Location was good, 25 mins drive to sdyney harbour. Do look for earlybird parking in sdyney as parking can be superbly expensive.. Weekends earlybird I paid $9/day (enter before 10am exit anytime-sdyney CBD) Weekdays earlybird I paid $25/day just FYI (enter before 0930 exit before 7pm-sdyney CBD) Look for Wilson parking in CBD area.. careful on the timings ! 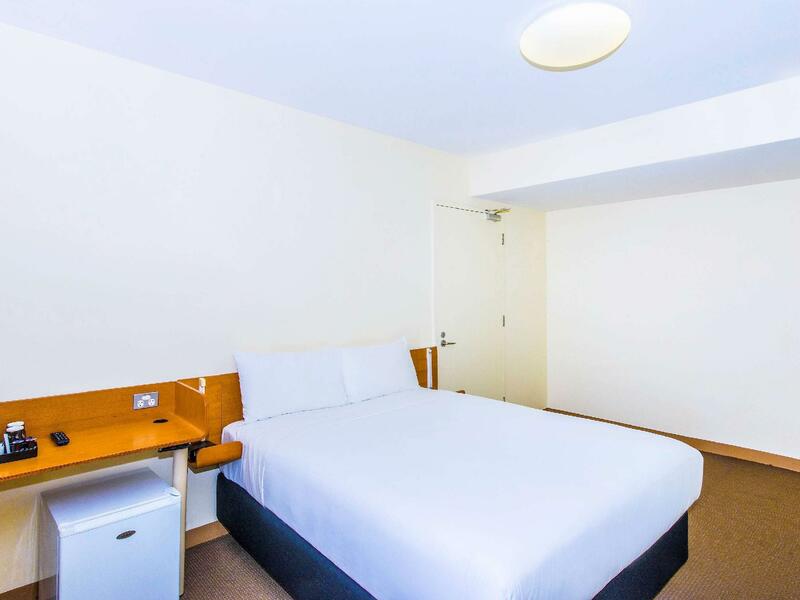 The Ibis Budget is almost perfectly located if you're attending a big sports event at Sydney's Olympic Park. Take the train to Olympic Park and walk 10 minutes to the hotel. If you get tired along the way there are a number eating/drinking stops before the hotel. Inside the hotel room itself was a little disappointing, as there was a hair or two on the bed, from previous guest or cleaner I assume. The other drawback was the lack of free internet. Overall, I got what I wanted from the hotel, a safe place to sleep, close to the Olympic Stadium.